If you cannot immediately enter a database while using a campus computer or the on-campus wireless network, please notify a librarian. When you attempt to enter a database off-campus (from home, a coffee shop, etc. ), the screen below will appear. Enter your myHUgo username (for example, jsmith rather than jsmith@mail.hodges.edu) and your current password. This should be all that you need to do in order to access library resources. 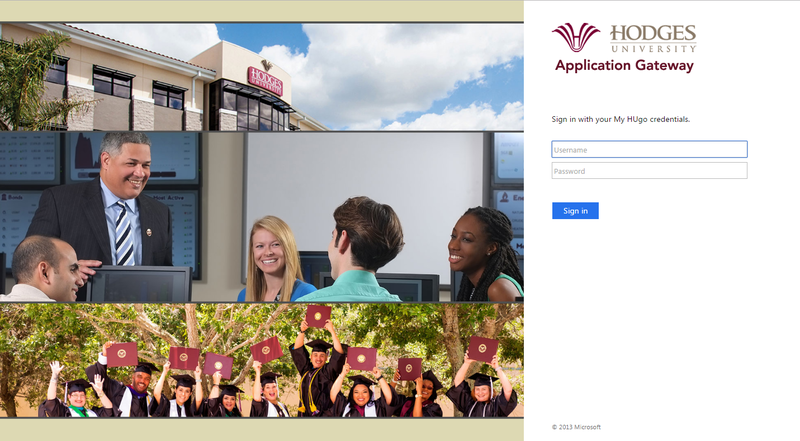 Are you Hodges University faculty or staff? Faculty and staff currently employed should have year-round access to library resources. Faculty should retain full access even during terms when they are not teaching. Are you a student taking one or more classes this term? Alumni do not have access to library databases. Students who took an A- or B-term class may not have access during terms for which they are not enrolled. Are you entering the correct myHUgo login information? Make sure that (1) you are entering your myHUgo username and not your full email, (2) you are using your current password, and (3) you have CAPS Lock off. Are there any restrictions on your account? For various reasons, the university sometimes will place holds to restrict certain activities on your account. Some of these holds block you from accessing library databases. Are you unable to access any databases, or just specific ones? If you cannot access any databases at all, please proceed to the steps below. If you can access some databases but not others, please let a librarian know the names of the databases you can't access. Reboot your computer and attempt a fresh login. Often this will clear the computer of whatever was blocking access, which could be a setting that loaded wrongly when the computer booted up. Clear your browser's cookies/cache/history/passwords. This Indiana University help page explains how. Then reboot your computer, re-enter the browser, and attempt to login to the database. Check if cookies are enabled in your browser. If not, enable them. This WikiHow Tutorial explains how. Lower your computer's security settings. Sometimes security settings are turned way up by default and may block access. This LifeHacker Tutorial explains how. Try logging in on a different computer or device. If you are using a work, public library, or other institutional computer or Internet network, that institution might block access to our databases on your computer or on their network. Contact us! Please try to be as detailed as possible in your message. Tell us exactly what resource you are attempting to access, and include a screenshot if possible. We are always happy to help!